I have good news to report: global warming is over, it was just a mistake or perhaps even a hoax. How do I know? Quite simple. Because it’s cold. Today. Where I live. Even world-famous climate experts like Donald Trump have pointed this out. Wait, is that how climate science works? No, but if your information comes from right-wing columns, blogs and TV “news” channels, you might think so. Global warming, is, of course, a long-term and, well, global phenomenon; quite simply the gradual increase of average temperatures of the entire planet. Elementary students learn an average is the mathematical blend of a range of numbers high and low. So although global average temperatures are gradually rising, weather continues to fluctuate as weather always has. What’s more, rising air and ocean temperatures trigger a wide range of effects, including heat waves and droughts but also stronger winds, heavier precipitation and floods, even worse winter storms. Now you ask me, how can global warming cause an ice storm, blizzard, or cold snap? Excellent question! A mild to medium snow storm, at minus 5 or 10 degrees, is a nuisance. But warm the thermometer a few degrees, approaching zero, and that snow becomes freezing rain, a much bigger problem. What could have been a normal day with flurries becomes a catastrophe, turning roads to rinks and knocking out power for days, even weeks! Last year Toronto even issued a report warning of just this risk, but sadly not much was done to prevent the problems we saw over Christmas. Living in the snow belt, we already understand lake effect snow: cold, dry winds blowing over large bodies of water lift moisture to dump on us as snow. But warmer air holds more moisture, and the warmer winters’ open water feeds more snow than would fall if lakes were iced over. That’s how global warming brings bigger snow dumps to our roads. What about the “polar vortex” linked to the North East’s current deep freeze and blizzard, and dozens of deaths? Again, look to global warming, as deep cold winds that normally circle the arctic are shoved back south by warmer-than-usual polar temperatures. That’s why, for example, the other day it was colder in Ottawa than at the North Pole! 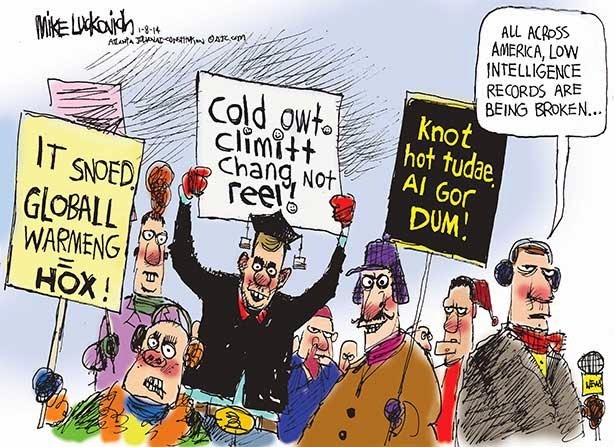 The right-wing is all atwitter over a recent mission to the Antarctic to study effects of global warming that failed when the ship got caught in unexpectedly early sea ice; the subtext being that global warming must be a silly error if there is more ice! Yet if any of these pundits did a minute’s basic research into global warming and the Antarctic, they’d find a long-term warming trend means less ice on Antarctic land, but more ice on water. For example, melting land ice dilutes the salt in the southern seas, allowing the water to freeze more easily. So although the expedition was hoping to study the effects of climate change on land, the fact that they couldn’t get there through the sea ice actually reinforces the science of climate change! The real truth of global warming is not that it nevermore gets cold, but that it creates climatic changes or “global weirding”; the same weather system that brought us the polar vortex has left our own BC coast unseasonably warm, and put the entirety of England and Wales under flood alert. Meanwhile, Australia is withering under record heat waves following their hottest year ever. To understand the reality of climate change we must look past today’s snowbanks to a long-term, global view. That view, more than ever, confirms that our climate, and the weather it spawns, will continue to get weirder until we find a way to pull back the excess greenhouse gases we’ve spent a century emitting. Publishes as my Root Issues column in the Barrie Examiner as 'Global Weirding' will get weirder without changes.